2019-02-06 11:35:032019-02-06 11:35:03https://quickbooks.intuit.com/in/resources/accounting-taxes/gst-in-india/Accounting & TaxesEnglishGoods and Services Tax is one of the greatest tax reforms of India. 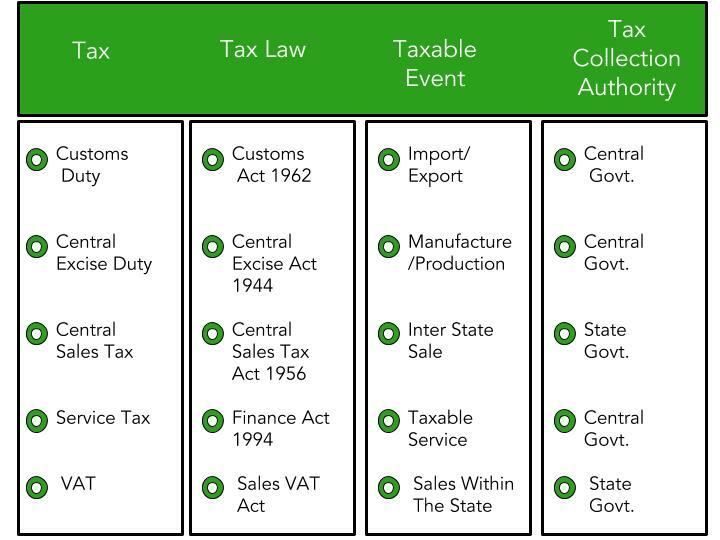 Here's everythig you need to know about what is GST in India.https://quickbooks.intuit.com/in/resources/in_qrc/uploads/2019/02/What-is-GST-in-India.jpghttps://quickbooks.intuit.com/in/resources/accounting-taxes/gst-in-india/Goods And Services Tax: What Is GST In India? The underlying reasons that mandated the implementation of a single, unified tax. Indian Tax Structure primarily consists of two types of taxes: ‘Direct Tax’ and ‘Indirect Tax’. Direct Tax is a tax levied directly on the income, wealth, and profession of an individual. Income Tax and Corporation Tax are the major direct taxes. Indirect Tax, on the other hand, is not chargeable on the direct income of an individual. It is rather levied on the goods and services consumed by the ultimate consumer. Customs and GST are the major indirect taxes in India. 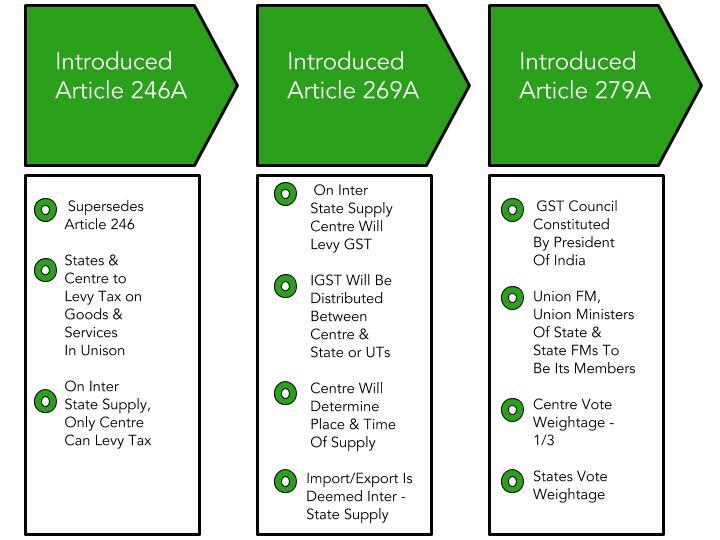 Now, the previous indirect tax system comprised of separate Centre and State laws. Such a tax structure not only increased the cost of goods but also made the taxation system more complex. Therefore, to bring in simplicity and reduce ‘cascading tax effect’, a single, unified tax in the form of GST was introduced. Such a tax system involves levy on the supply of goods or services or both with concurrent jurisdiction of Centre and States. 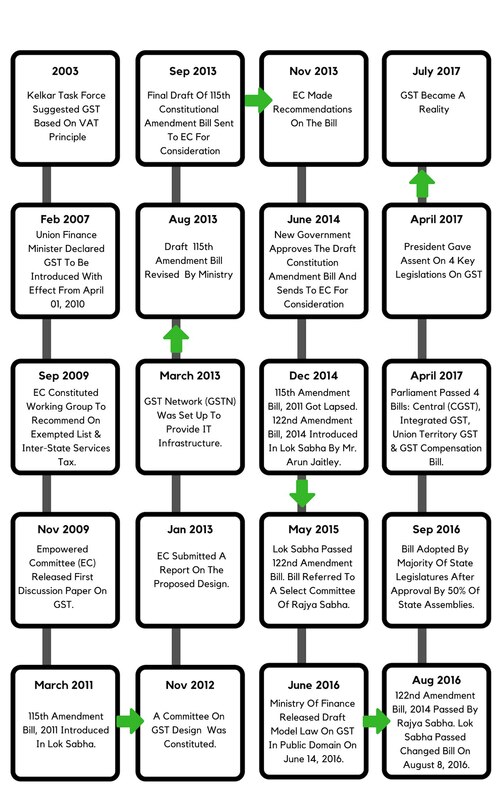 So, let’s try to understand as to ‘What Is GST’, ‘Why It Was Introduced’ and ‘Its Impact on you’ after implementation. GST is a single, destination based indirect tax. It is levied on value added to goods as well as services at each stage of the supply chain. The main objective behind levying such a tax is to consolidate multiple indirect tax levies into a single tax. Thus, GST subsumes a host of taxes. It overcomes limitations of the previous indirect tax structure. Furthermore, it brings efficiency in the administration of tax. To elucidate the above definition, we can say that GST is based on two principles: ‘Destination Principle’ and ‘Value Added Principle. ‘Destination Principle’ states that the supply of goods and services would be taxed at the point of consumption. This means that GST replaces source based tax system with destination based tax regime. 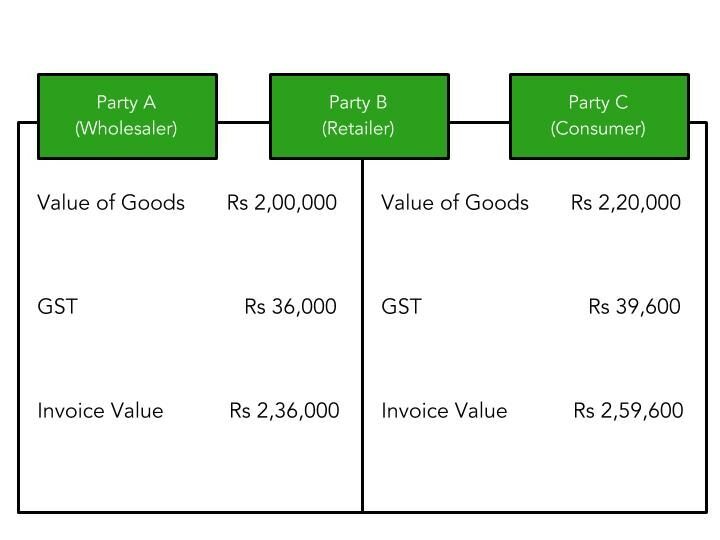 ‘Value Added Principle’ on the other hand underlines that the tax shall be collected on value-added to goods or services at each stage of the supply chain. Right from the original producer or service provider to the ultimate consumer, GST will be collected on value added at every stage of the supply chain. Furthermore, GST paid on the purchase of goods and services can be set off against the output tax payable on the supply of goods and services. Thus, GST provides for comprehensive and continuous tax throughout the supply chain. It does away with the cascading effect of taxes. Just like the state level Value Added Tax (VAT) levied on sale of inter-state goods, GST is a national level tax that incorporates value added principle. Therefore, we can say that GST is a well designed VAT on goods and services. It eliminates the shortcomings such as marginal benefit of tax credit and multiplicity of taxes that persisted in VAT. Say for instance, A, a wholesaler sells the goods to B, a Retailer for Rs 2,00,000 @18% GST. B adds some value to the goods and sells them to the final consumer C for Rs 2,20,000 @ 18% GST. Now, A collects GST of Rs 36,000 from B on the supply of goods. B on selling goods to C collects GST of Rs 39,600 from C. As we can see, GST is collected at every point of consumption throughout the supply chain, thus submitting to the ‘Destination’ Principle. Furthermore, B just pays Rs 3,600 to the government towards GST. This is because B claims an input tax credit of Rs 36,000. This is the amount of GST that he paid on the inputs purchased. Such amount is set off against the output tax of Rs 39,600 that he collected from C. Thus, B pays tax on the amount of value added to the goods which is worth Rs 20,000. Under the previous indirect tax regime, both Centre and States levied and collected taxes on goods and services separately. The tax collected at each level of authority was as per the respective subjects enumerated in the Union and State Lists. In respect of goods, the Centre had powers to levy tax on the manufacture of goods except alcohol for human consumption, narcotics etc. Whereas the State governments had powers to levy tax on the sale of goods. In respect of Services, only the Centre had the power to levy and collect Service Tax. Hence, Central Excise, Customs and Service Tax were the three main components of indirect taxes for the Central Government. While VAT and Central Sales Tax (CST) were the major taxes for the State Governments along with Octroi, Entertainment Tax etc. Such multiplicity of taxes gave way to multiple taxable events. In such a scenario, taxes were levied by different authorities on the same subject or transaction. Moreover, taxes paid on input goods could not be set off against the output tax payable on services or vice versa. Also, there was non-availability of set off against other State or Central Government levies. All this resulted in cascading of taxes that ultimately increased the cost of goods. Octroi was collected by BMC. Accordingly, same set of goods have been charged for Central Excise, VAT, Central Sales Tax, Entry Tax and Octroi at different points. Thus, such a tax structure escalated the cost. Also, the credit of Central Excise paid on manufacture of goods could not be claimed either against VAT or Service Tax. In order to introduce GST, the Constitution Of India amended One Hundred and First Amendment Act, 2016. The following graphic shows the important amendments carried out by the Constitution in the Act. India is a federal country, where both Centre and States have powers to levy and collect taxes under respective legislation. Hence, a dual GST model is implemented in India. Under the dual model, the power to levy taxes is distributed between Centre and States. Accordingly there are four components of GST: CGST, SGST, IGST and UTGST. Central GST (CGST) is levied on intra-state supply of goods and services by the Central Government. It is governed by CGST Act. The State GST (SGST) is levied on the intra-state supply of goods and services by the State Government. It is governed by the SGST Act. Integrated GST (IGST) is levied on the inter-state supply of goods and services by the Central Government. It is governed by the IGST Act. The term ‘inter-state’ supply also includes 1) imports and exports 2) goods supplied to foreign tourists and 3) goods supplied to or by Special Economic Zones (SEZs). For instance, ABC Ltd, a manufacturer in Punjab supplies goods to XYZ Ltd, a wholesale dealer in Punjab for INR 2,00,00 @18% GST. XYZ Ltd further supplies these goods to PQR Ltd a retailer in Maharashtra for INR 2,50,000 @18% GST. Finally, PQR Ltd sells the goods at INR 2,70,000 to L, a consumer in Maharashtra. 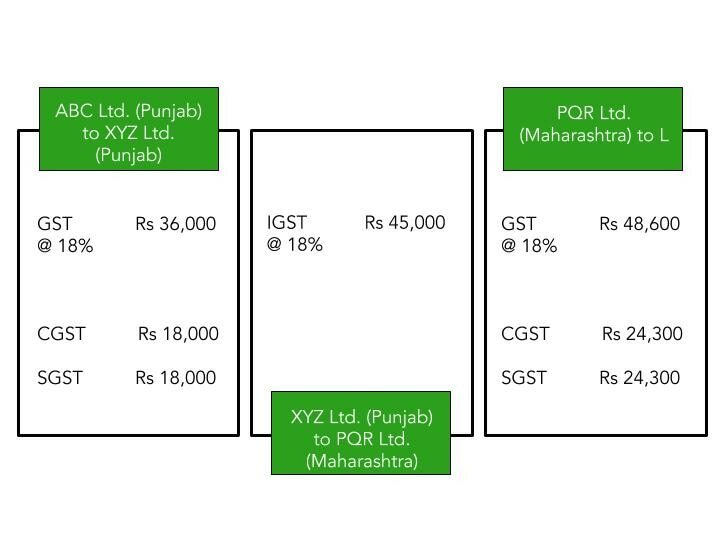 The following graphic depicts the working of dual GST model. GST is undoubtedly one of the biggest tax reforms since India opened its gates to the world economy in 1991. It aims to create a unified market throughout the nation by subsuming multiple taxes and reducing tax compliance. However, despite having a number of advantages, GST comes with its own set of shortcomings. Unorganized businesses would now be regulated as input tax credit can be availed only when supplier accepts the amount. GST was first proposed in India under the Vajpayee Government in July 2000. The job of designing a GST model was entrusted to an Empowered Committee of State Finance Ministers especially set up for the purpose. Since then, the journey of GST has been a long one with its own set of peaks and troughs. Finally, it was in July 2017 that GST became a reality.